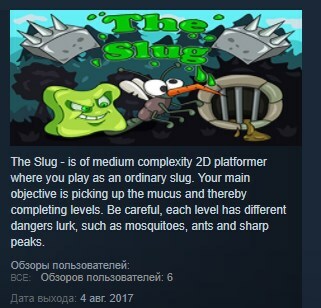 The Slug - is of medium complexity 2D platformer where you play as an ordinary slug. Your main objective is picking up the mucus and thereby completing levels. Be careful, each level has different dangers lurk, such as mosquitoes, ants and sharp peaks. Faced with them your main character instantly dies, respectively, the level starts over. Jumping on ants, you without harm to yourself kill them, it will help you pass the levels without unnecessary enemies. Think over every step, because if you step on the wrong platform, you can´t come back.